The Turkish lira fell as low as 5.84 to U.S. dollar on Friday after the Treasury and Finance Minister Berat Albayrak called the Turkish liras volatility a planned ''manipulation,’’ by powers looking to influence the March 31 local elections, Cumhuriyet newspaper reported on Saturday. The lira was 5.75 against the U.S. dollar prior to Albayrak’s speech, Cumhuriyet said, underlining the fragility of the currency. The lira dropped by more than 4 percent against the dollar on Friday, amid new tensions between Turkey and the United States and after an unexpected fall in the Turkish central bank’s foreign currency reserves. Noting that Turkey is faced with ''an incredible disinformation’’ effort over social media that is ''similar to the 2013 Gezi protests,’’Albayrak said, ‘’we will and and see,’’ while pointing to an operation underway to manipulate public perception. 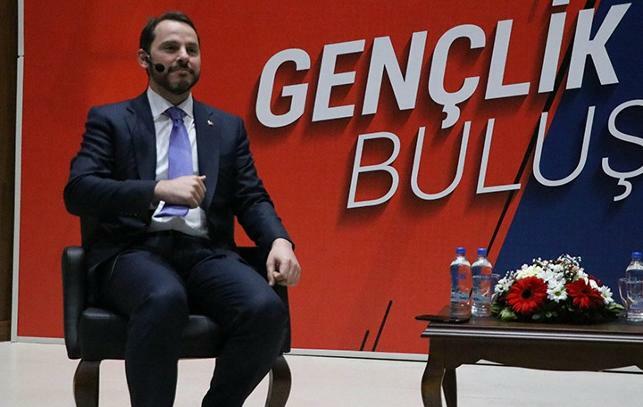 Albayrak has said the worst of the economic crisis is over, however, the plummeting value of the Turkish lira since August 2018 has damaged industrial confidence, triggering a record-breaking inflation, which hit a 15-year high in October 2018 when it touched 25 percent. ''The Turkish economy is taking powerful steps with each passing day. In the months ahead, most likely in the summer, we will witness positive periods in our current account deficit,’’ Albayrak added, noting that single digits in inflation await Turkey in the near future. Consumer price inflation slowed to 19.7 percent in February from a 15-year high of 25.2 percent in October. Turkish economist Uğur Gürses told German broadcaster Deutsche Welle the reason for the Turkish lira is losing value is the caused by the questioning by foreign investors of Turkey’s eroding foreign exchange reserve. Gürses notes that three elements that cannot coincide are being implemented by Ankara, that is to say, free capital movement, a fixed currency regime and an independent monetary policy. ''What this means is that in an open economy, you cannot control both the foreign exchange currency and interest at the same time. And certainly not with "back door" methods,’’ Gürses said. The central bank on Friday announced that it had suspended one-week repo auctions for an undefined length of time, resulting in the average cost of funding in Turkey to a near record jump, according to Reuters. The central bank has been keeping one-week repo lending rate at 24 percent since September to help arrest a slump in the lira and curb inflation. It remains to be seen if Turkey’s ongoing economic woes will affect the country’s ruling Justice and Development Party (AKP) at the March 31 polls. Hazine ve Maliye Bakanı Berat Albayrak, " Eylül ayında tek haneyi görmek mümkün. 31 Mart yerel seçim sonucu ne olursa olsun. Seçim sonrası önümüz çok açık uzun süre seçim yok." dedi. Berat Albayrak dolar kurundaki yükselişe ilişkin, ''Birileri seçim sürecini etkilemek istiyor, pişman olacaklar. Bilinçli bir manipülasyon ile algı operasyonu yapılıyor'' dedi. Albayrak programa başladığı sıralarda (20.00) 5.75 lira olan dolar, programın bitiminde ise 5.84’e doğru yol alıyordu.